As I start each new day I try to remember to be thankful for the things that I have. Some days it is easier than others to do so. When there is stress at home, deadlines at work, personal loss, or just the crazy world in which we live, it is hard to be thankful. One way that I have found to be thankful is to look at the small things in life. The week of peace when both kids are at camp, and the joyful reunions when they came home. The impromptu neighborhood get together around the fire pit. The sweet call of the cardinal in my apple tree at 4 am, ok I'm not really thankful for that one. Doing a good deed without thought of payment or return favors. 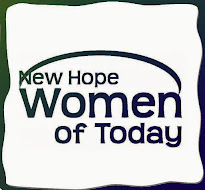 The strength I gain by being a member of the New Hope Women of Today. I am so grateful for the opportunities this organization has given me. In addition to these opportunities, I have made some wonderful friends that I know I can count on when the going gets tough, and can celebrate successes with when the road is freshly paved. I challenge you to be thankful every day, lean on your fellow members, and to share the opportunity of Women of Today with people you know and people that you meet in the community.